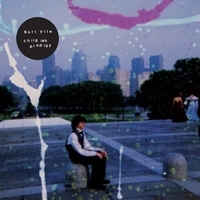 I’ve been listening to some records by Kurt Vile this week. (Smoke Ring For My Halo, Childish Prodigy, Constant Hitmaker, God Is Saying This to You…) I first heard his name from an ad on NPR music. I assumed at the time that it was a play on words referring to the composer Kurt Weil. (Whom I love.) This assumption triggered the following train of thought: “Hm…joke about Kurt Weil, coming out on Matador, must be some kind of snide New York hipster record that doesn’t have much heart behind it. Don’t think I’ll plan on listening to that one. Indie rock has really gotten shallow these days.” I mean, I really hate bands whose names are in-jokes that refer to other artists. I mean, I’d never name a band *I* was in something like that. NEVER. I mean, really. I was listening to The Woods on Spotify (and feeling guilty about it) last Tuesday when a link came up to Kurt Vile as a “related artist.” I decided to check him out, despite my initial reaction. The first thing I noticed was a picture of a singer playing an acoustic guitar. I was surprised. The image of an acoustic guitar wasn’t what I had in mind when I heard the NPR ad. It also didn’t fit with Kurt’s Joey Ramone-like hair. As the first bars of “Baby’s Arms” came out of my crappy Logitech laptop speakers, I said, “wait, this is actually good.” Lo and behold, I had a Kurt Vile playlist up and running on my Spotify account a few hours later. And still feeling guilty about it. How’s anyone sell any records these days with freeloaders like me running around? So, I googled Kurt Vile and learned that his name has nothing to do with Kurt Weil. It’s his given name. I read an article about him in the New York Times and I didn’t have the impression of a snotty attitude either. My inner monolog had been a complete fabrication that was based on a simple misunderstanding. I mean, I’m listening to “Runner Up” right now and it’s really the furthest thing from what I anticipated. All of this reminded me of something Narayan Liebenson Grady, one of my dharma teachers, once said to a class I was taking at the Cambridge Insight Meditation Center many years ago. “We think a lot of things, but we almost never think that we’re deluded. Practice is asking us to question that assumption.” How much of our lives are spent lost in inner monologs like the one I spun out from a simple NPR commercial? What would life be like if we attended to what’s happening without “spinning” it, one way or another? One thing’s sure: the entire political process would become instantly unrecognizable. So check out Kurt Vile with a fresh ear. (My playlist has made it’s way around to Good Lookin Out from the Hunchback EP.) And don’t be a deadbeat like me: log out of Spotify and pick up a copy at your local independent record store. 18 Feb	This entry was published on February 18, 2012 at 3:00 am and is filed under Buddhism, Music, Record Reviews, The Dharma. Bookmark the permalink. Follow any comments here with the RSS feed for this post.